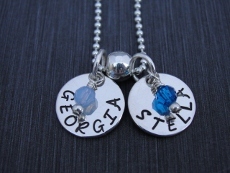 Our sterling silver discs are hand stamped with our script font and then hung on sterling silver ball chains. Choose from 4 different size discs, make them all the size or all different sizes. The discs are stamped around the bottom. The 1/2" disc holds 7 letters, the 9/16" disc holds 9 letters, the 5/8" disc hold 10 letters and the 3/4" disc holds up to 12 letters. Spacers can be added to the necklace as well as charms. 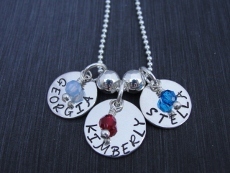 For color add a birthstone bead charm that hangs on top of each disc.